Size matters: We recommend a 20 gallon GeoPlanter pot. GeoPots are made of a durable fabric, rather than plastic or wood, and lets roots breathe. When roots reach the fabric edge in the pot, they are air pruned, rather than becoming root bound. This pruning of the root tips at the wall of the container forces branching of thousands of fibrous feeder roots throughout the plant container. GeoPots are also convenient because they are light weight and able to be folded for storage. A 20 gallon container will hold only one plant. Anything smaller will hamper the plant's ability to produce fruit and remain healthy. Love Apple Farms will have the 20 gallon GeoPlanter pot available for purchase at our Tomato Plant Sale in Scotts Valley. The 20 gallon size is 20" tall and 15" wide. If you are using something other than a GeoPot, it must hold 20 gallons of soil and it must have drainage holes. A half wine barrel will hold two plants. If you are re-using a container, you should disinfect it first. We use a bleach solution of one part bleach to 10 parts water. A simple quick dunk or spray, followed by a rinse with fresh water, should do the trick. Potting Soil: Do NOT use garden soil or home-made compost in your pots. Tomatoes are disease-prone and one of the benefits of growing in a pot is that they cannot pick up any soil- or compost-borne diseases if you use a sterile potting mix. We recommend G&B Organic Potting Soil. It's available at our retail greenhouse in Scotts Valley, CA. You should also be able to pick it up at your good local California nursery. Check the Kellogg Garden website to locate your closest supplier. You can go very wrong with potting soil, so don't deviate from this instruction. We still want you to put in the container all our recommended additives, but first add four inches of soil on the bottom of the pot. Fertilizers: Our perfect planting amendments for pots are: One cup of G&B Fish Meal, one cup of G&B 4-6-3 dry organic Tomato, Vegetable & Herb fertilizer, one cup of G&B Bone Meal, three or four crushed chicken eggshells, one cup of 100% pure worm castings (available at our Plant Sale), and two aspirin tablets. Once the amendments have been added (stir them around a bit), add more potting soil and place your tomato plant in the container, backfilling with soil as you go, until you've put at least half the stem under the soil. Tomatoes like to be planted deep - they benefit from it. Continue filling around the plant until the soil is at the very top of the pot. There's no need to firm down, watering will do that for you. Watering: Water them in well. We'll water then once, wait about 10 minutes, then water again, wait, then again. It takes a lot of water to completely saturate the potting soil. Even if you see water draining out of the holes, that doesn't necessarily mean the root ball is soaked. After you water the new plantings three times their first day, you probably will not need to water again for at least a week and probably longer. Tomatoes do NOT like to be saturated all the time, and you can easily kill the tomato by overwatering it in a cool springtime. As the weather really heats up and your plant is getting big, they need more water. You may end up watering once a day if your tomato plant is 6 or more feet tall and it is consistently over 80 degrees. When a tomato is grown in the ground, it never needs watering that often. But in a pot, it does indeed (once the plant gets big and the weather gets hot). And the smaller the pot, the more often they will need watering. Staking: The tomato in the pot will still need staking. Our 7 foot tall custom-made tomato cages can be popped right over them. If you treat the plants right, they can and will get up and over that 7 foot cage. We have a tutorial for you on how to make these mondo cages, found here. Supplemental fertilizing: Even with all the goodies in the pot, your plants will start to decline in health around week six or so if you don't start fertilizing them from the top down. We use worm casting tea, made out of pure organic worm castings. Mix a handful in a five gallon bucket of water and fertilize with two gallons of that at least once a week. If you can't get worm castings, then use a good all-purpose organic liquid fertilizer once a week. You'll need at least two gallons of the diluted-according-to-directions fertilizer per pot per week. Start the fertilizing regimen around week six to avoid the summer doldrums. We love to spray the worm casting tea on the foliage (along with an aspirin tablet for disease suppression). But tomatoes in a pot need more fertilizing than that, hence pouring a fertilizer mix IN the pot as noted above. You need only shade the lower part of the cage, but we still pin it about a foot above the top of the pot, all the way to the ground. Small binder clips work great for pinning. Shade cloths can be purchased at good hardware stores. 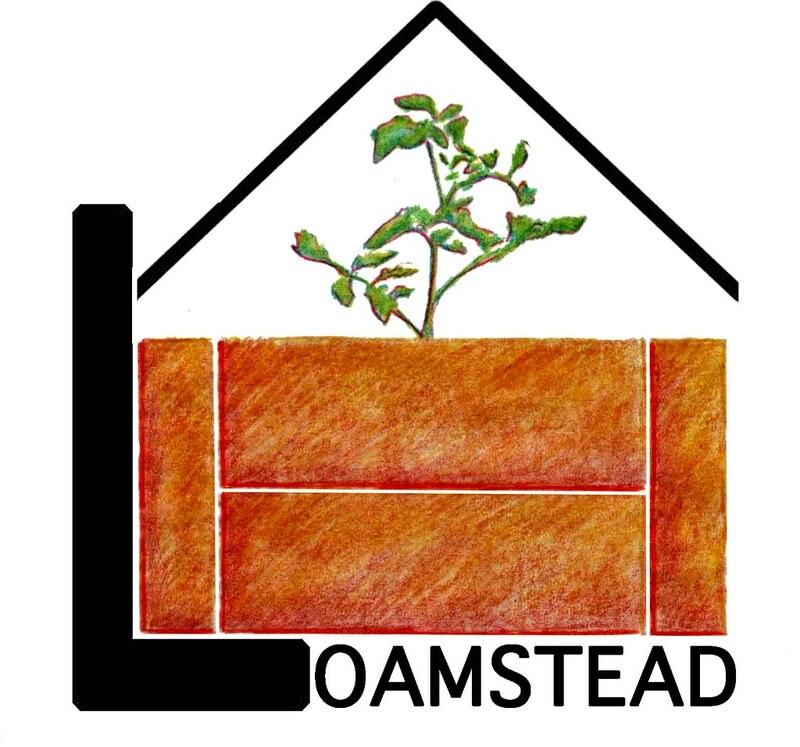 Finishing up the season: As your tomato plant winds down in vigor in the fall, you can compost your plants and the soil, but you should not re-use the soil next year in the pot. Re-using potting soil inside a container is never a good idea, as viruses and other harmful diseases can infect your plants the following season. There is one way, however, to salvage your soil for next year, and that is by sowing a cover-crop in your pots and nurturing that throughout the winter. When you are planting your tomatoes in these same pots the following spring, simply pull out the cover crop (compost them), then remove half the soil to a tarp, add your amendments listed above, and plant accordingly using the remainder of the soil you initially removed. You will no doubt need to top off the pot, as you will have lost several inches of soil throughout the year. Top off with G&B Potting Soil. Any questions? Email Cynthia at loveapplefarms@gmail.com. Or take Love Apple Farms' Tomato Masters class or Container Vegetable Gardening Class. What modifications should I make if I love at 7500 feet altitude? Our growing season is SHoRT! Which plants have the quickest seed to harvest time? Hi Reed. You're not looking in the right nurseries for our recommended products. We use mostly Gardner & Bloome potting soils and fertilizers because they WORK, they're organic, and they are a local California company. You can go on the G&B website and find out which nursery near you carries their products. Also, we sell all of these amendments at our gigantic tomato plant sale each spring in Scotts Valley. Hope to see you there! I was introduced to your farm/service recently by a friend who has wonderfully flavorful tomatoes. So we bought a few plants and the little green How to Grow Better Tomato book at the flower show last weekend. Didn't realize at the time that the L A Farms was such sophisticated operation with a comprehensive website. But where I am having difficulty in following the advise in the book is in finding your recommended fertilizer products. OSH has only one of the several items listed and the local ACE, Pete's of Castro Valley, has none. But they do carry a full line of another brand's products that APPEAR to be the equivalent kind of soil amendments. I think it would be a very useful addition to the book and the website to expand the list to include at least a second and perhaps more lines products that are the equivalent of the single recommended line.